The CareGiver Partnership: Depend Adult Diapers (briefs) - What happened to them? Where can I buy them? Depend Adult Diapers (briefs) - What happened to them? Where can I buy them? This is a question we've heard from so many customers. Why don't the stores carry this product? Its usually because it does not sell well and they have other uses for the space - like the new Depend Silhouettes for Women and Real Fit for Men. 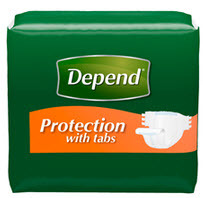 Regardless what the reason is for Depend Protection with Tabs being discontinued by the stores, there are thousands of consumers who appreciated the extra protection they provide. We have been fielding calls from frustrated consumers who can no longer find Depend Protection with tabs in the stores. The good news is that we have an ample supply of both sizes, as well as samples to try before you buy that we can deliver to you right away. We realize these products are very confusing for many consumers. Only recently, these were called Depend Briefs. However, the Depend people decided to change the name of pull-on underwear to briefs and therefore had to change the name of 'briefs' to something else, so they settled on Protection with tabs. This product type is also sometimes referred to as a 'diaper' in that it resembles old baby diapers that have tape tabs. They are also changing the case count from 4 - 20 count bags on medium size to 3 bags per case. The same is happening on the large size going from 4 - 16 count bags to 3 bags per case. We are working on details of the pricing as we believe they will be lowering the case price accordingly. They are reducing the number of packages per case at the behest of the 'big stores' that don't want to have much inventory on the shelves. Our shelves are fully stocked. We ship the same day in most cases, doorstep delivery is included with these items and you can expect delivery in 3 to 5 work days, sometimes even the next day depending where you live. Depend Protection with Tabs is the most absorbent Depend you can buy. So if you need maximum protection, this is the product we recommend you try. A full case of medium size (19"- 34" Waist 26"- 41" Hip) includes 80 pair with 4 packages of 20 briefs and costs $85. Also available in large size (35"- 49" Waist; 42"- 54" Hip. A case of 64 includes 4 packages of 16 briefs for $85. Both includes immediate, convenient shipment to your doorstep. Delivered within 3 to 5 days -- many times in 1 to 2 days. As of August 2012, the case counts and pricing will be changing as noted above. We have samples we can send you to try. $3.49 for a 2-count sample. Call us at 1-800-985-1353 M-F 9-4 with any questions. You can save $8.00 off your first order (and 5% on all future NRO orders) if you elect to take advantage of the convenient Never Run Out service which ensures you'll never run out of needed supplies. You can modify or cancel at anytime. Plus you can use up to four manufacturers coupons on each case -- that can save you an additional $6.00 per case. So with the value of your time, the high cost of gas today and the fact that stores can be out of stock, home delivery can be a big convenience and good overall value.